Portrait of Rob Sheffield as a young American. Rob Sheffield’s work for Rolling Stone is always fun to read because he enjoys both history and humor. What the magazine leaves off is his often profoundly personal connection to the things he reviews. The charm of his three books always lies in the fact of their greater intimacy with Sheffield, as well as his willingness to spread out on a topic, preferring a leisurely meander to circumnavigate his subject rather than the straightforward consideration common to his reviewing. Unlike Love Is a Mix Tape, Talking to Girls About Duran Duran and Turn Around Bright Eyes, On Bowie is written in a far more urgent manner that lends even greater pathos to Sheffield’s usual concerns. Sheffield has long been a chief defender of all things new wave and his David Bowie fandom is well documented. So when Bowie passed away suddenly in January, Sheffield climbed out of his research for an ongoing Beatles project and immersed himself in grief for his dead hero. He completed the writing for On Bowie in 30 days, reminding himself that Bowie produced Low in a similarly short span of time. As a result, the book is in no way meant to be viewed as a comprehensive history. Rather, it's about one fan who is working through a cornucopia of intense emotions, holding a textual funeral for his idol. He’s a good man to do it on behalf of all misfits touched by Bowie’s music and personae. “I can still remember what I thought that song [“DJ”] meant to me in my teens, he reflects, “but it mattered a lot more when I was older and had lived a life worth getting confused about” (28). Indeed, the many faces of Bowie still shift out from under us and elude easy explanation. The author wisely owns all his takes on Bowie’s many selves, rooting them in a fan’s feelings, never presenting these blurry portraits as definitive or dry academic analyses. On Bowie is shot through with color and feeling. One of Sheffield’s best tricks is his ability to incorporate song lyrics into his prose. Seldom does he reference the music through proper acknowledgement and quotation marks. He’ll just drop in a phrase or even a complete sentence, infusing the text with the profoundly poetic sensibility that was itself one of Bowie’s greatest gifts. Die hard fans may catch many of these references and even casual fans will suss out little echoes here and there. In a few places, he plays a free-association game with himself, finding common threads among several songs and piling up the references in an impressionistic way, as in: “Blue blue electric blue, that’s the color of my room. Put on your red shoes and dance the blues. I never did anything out of the blue. Now my Blue Jean’s blue. See these eyes so green, I could stare for a thousand years” (55). Every album gets some kind of attention and Sheffield is not shy about giving his opinion of what rocked and what sucked. The book is roughly chronological, but as time marches on, Sheffield eases backward into the type of reflection that only a life-long appreciation such as his can provide. The places he chooses for focus may not be every fan’s pick, but his reminisces still manage to shed constant light. There's a surprisingly broad and deep comparison with Neil Young that concludes, “both sang their fears of losing their youth when they were still basically kids; both aged mysteriously well. Neither ever did anything remotely sane” (63). There's plenty about Iggy Pop, but not much about Lou Reed. He considers the Nazi salute controversy and gives common-sensical weight to Bowie’s repudiation of the moment because “as far as I can tell, it’s the only stupid thing Bowie ever denied doing” (132). He makes several loving forays into Bowie’s attraction to loud colors, repeatedly tackling orange. “I used to wear a pin on my sweater with that Bowie head shot [from the Low album cover] on it”, he recalls. “What continually impressed me is how people could recognize that shade of orange from across a room. Low Orange is a color that doesn’t exist elsewhere in nature. If you notice it when you see it, you’re probably a Bowie freak” (139). Bowie’s dormant years and later resurgence get ample coverage where many lesser writers would have jammed them into one or two quick chapters at the end. In particular, Sheffield considers the strength of Bowie’s marriage with the same endearing sentimentality found in his other books, giving credit to Iman where it is due: “The cliché about how rock stars write all their good tunes when they’re young and miserable, then they get happy and go soft? And their sober family-man music is a bore? Another cliché Bowie decided to destroy. He is the prime example of a rock star who found the right muse and slowly got his mojo back. Iman got him to the church on time” (171). See that well-placed, relevant “Modern Love” reference there at the end? My favorite part -- my favorite moment in any Bowie song -- comes at the end [of “Young Americans”], when the Dame goes into that dizzy heavy-breathing incantation. […] He throws up his hands and just tells it: ‘I want what you want. I want what you want. You want them, I want you, you want I, I want you want. I want what you want, but you want what they want you, you want I, I want you. And all I want is the young American.’ Well, that clears everything up. […] He wants to be a young American, he wants to do a young American, but most of all he wants to participate in our want somehow (95-6). Sheffield also wants to participate in that want. This is a book by a huge Bowie fan meant to be read by anyone with even a passing knowledge of Bowie. 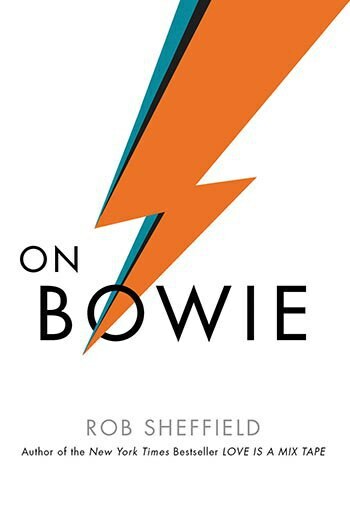 Outside the pleasant undercurrent of his extremely thorough display of lyrical knowledge, Sheffield never makes such obscure references that a reader becomes overwhelmed, though a reader who has under-appreciated Bowie will find plenty of reading and listening recommendations for further study. The true delight of On Bowie is that it succeeds in grieving for all of us. We want this moving work of tribute and Sheffield is honored to deliver it to us because he knows “Bowie’s audience was his instrument” (100).